I need to share this amazing app that Eliana and I used on our most recent road trip - PlayPlaces. Before the trip I downloaded an app called "PlayPlaces". I crossed my fingers and hoped it would live up to my expectations - it did. The app simply allows you to find any type of play space that is near your current location. For example, on our way from Centerville - Chicago (about a 5 hour segment), Eliana started to get restless around hour 3. I simply used the app to find a McDonald's play place on our route. Eliana was able to crawl around on the McDonald's play set for about 45 minutes and then we got back in the car to finish our trip. Even if the overall trip ends up being 5 hours and 45 minutes - I would add a little time to any road trip if it means I have a happy and content baby/toddler in the back! Above is a screen shot (from an Android phone, but the app is also made for iPhones). 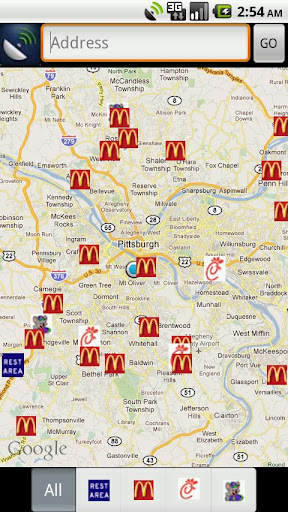 It allows you to find: Rest Areas, McDonald's Playplace, Chick-Fil-A Play Areas and Chuck-E-Cheese Restaurants. You can narrow your search and look for only one or two of the above or you can search for "All". Before we had this app, I would look for a Mcdonald's on the highway signs and just hope that it had a playplace inside. Most often, they don't. Now I can specifically look on my route for a play space - brilliant!